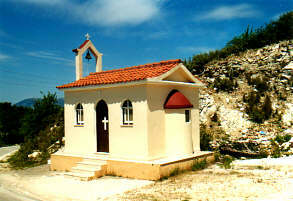 Meganisi is a small island, that can be reached by ferry from Lefkas. 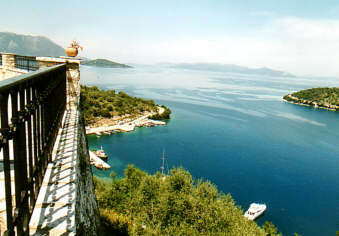 The route of the ferry is close to Skorpios, saving you the trouble of doing a cruise just to see the island of Onassis. 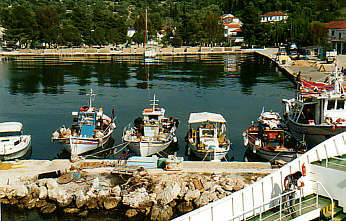 Meganisi has two harbors. 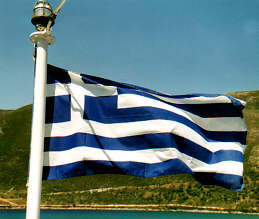 First the ferry reaches Spilia, and after a short stop it goes to Vathy. This creates an ideal situation to do a walk from one harbor to the other. The problem is that this takes only a little over one hour, and furthermore you see only the coastal road. 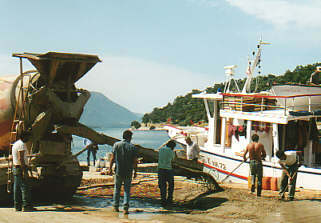 We left the boat at Vathy, and went inland to a small mountain village, Katomeri. 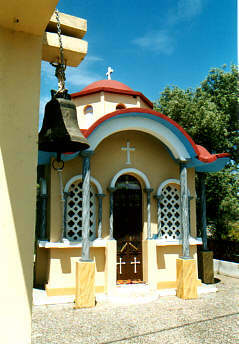 Although there can't live more than 100 people here, we saw three churches, and the village square has a big bell tower. Grandeur in a small place (even though the churches are very small). Then we went through the hills to Spartochori. 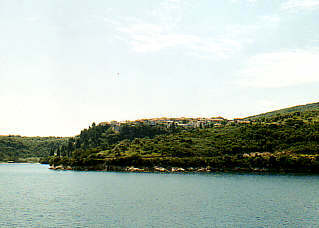 The village itself lies on top of a hill, and Spilia the harbor, is situated down below. It takes a lot of stairs to reach the harbor. After our lunch break we took the coastal road back to Vathy. There are a lot of bays and outcrops, so you can't see Vathy until you are very close. The route we took are the two main roads of the island, but there wasn't much traffic. Now and then a dump truck or a scooter, that is all. At Vathy we had some time left before the ferry would come, so we took something to drink on a terrace with view on the harbor. And there was a show for us: some men were paving a part of the road. First the old pavement was cut out, then a reinforcement was put in place and concrete was shoveled over it. With a wooden board the surface was leveled out. All this (except the mixing of the concrete) was done by hand. Nice way to pass the time (we always love to see other people work).